Over one million people live in the Milwaukee and surrounding area. Visitors number in the millions as well. There are many reasons that visitors come from all over the world. Whether it’s attending a business conference, visiting family and friends, taking in the world’s biggest music festival (Summerfest), or simply enjoying the area’s natural beauty and central Midwestern location, Milwaukee has a lot to offer. It seems like the people of Milwaukee love the outdoors and large events. Often referred to as the “City of Festivals,” Milwaukee has various cultural events which take place throughout the summer at Maier Festival Park, on the lake. Museums and cultural events, such as Jazz in the Park, occur weekly in downtown parks. 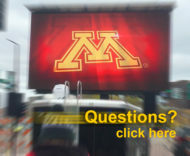 These events are perfect for the mobile LED screens from Fire Up Video. The sponsors of these events are looking for ways to connect and communicate with the audience. And the audience is looking to have a great experience while at the event. 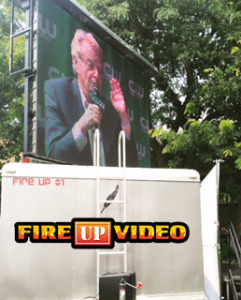 Renting a mobile big screen TV from Fire Up Video can help you accomplish all your goals as an event organizer. Our big Jumbotron TVs go up and down very quickly and have a very small footprint. They even have their own power supply built right in. Guests will love the video board because it can give front row views for everyone with our live video production. We can help create excitement and engagement with your crowd. The video screen can help your sponsors connect with your guests as well. Event Sponsors are an important part of any show, and it is just as important to keep them happy and give them value. We will work with you to display any content you want directly to the big screen. If you’re an event organizer, you may want to consider a large outdoor screen rental from Fire Up Video to help make your Milwaukee event the best it can be. We serve the entire Midwest and all other cities of Wisconsin, including Green Bay, Madison, Eau Claire, La Crosse, Oshkosh, Appleton, Wausau, Kenosha, Racine, Wisoconsin Dells, Waukesha, Janesville, Menomonie, Steven’s Point, and everywhere in between. Contact us with any questions at 844-533-8848 or baum3@earthlink.net.